This open studio titled Une éventuelle altération, presents the projects of Zainab Andalibe, being part of the summer’s lab program. Exhibited in exclusivity at Le Cube, these projects aim at finding a point of balance between aesthetic research and the social context. Altération géographique is an installation of glass plates in the shape of continents with a hammer placed next to them. With such a combination, this project includes a sense of fragility and a possible destruction that is to come. The presented cartography draws imaginary territories whose stability is not definitive, at all. Positioned in the space, this piece forces the spectator to adopt a walk on the rhythm of the elements that constitute the installation. However, the latter being off scale, operates a circulation outside the represented territories, finding himself or herself in a sort of no place. The proximity of the hammer and the cartographic plaques in glass induce a possible alteration of the whole. This raises the question of a possible disappearance of the geographical territory and questions the position of humans in regard to their geographic attachment. In the second room, the installation in-certain équilibre is composed of multicolored ceramic tubes, suspended in space. The gap between these tubes, heavy by their material and their suspension in space, create a dynamic, fragile balance ready to break at any moment. This feeling of fragility translates into the question of an uncertain future. 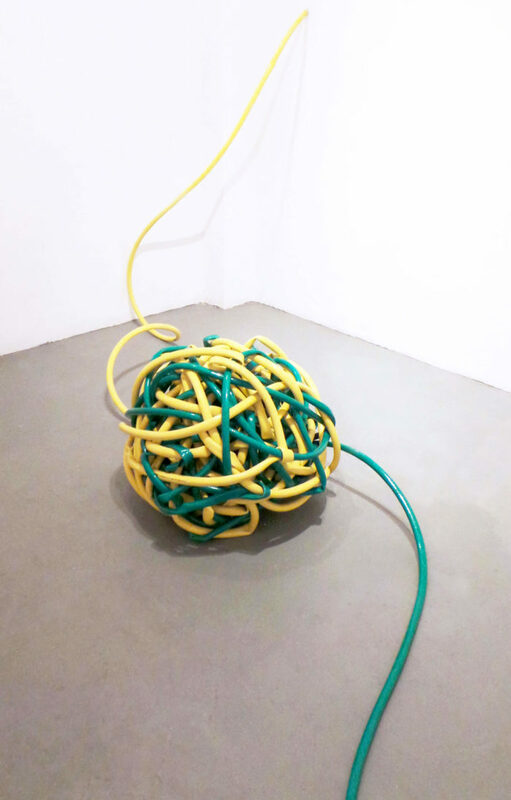 Aiming to invite the public to self-questioning, Oukda is a ball made of knotted garden hoses. This medium whose functionality is altered, rendered impossible by the piece itself, becomes then a contemplative object without any usage. Finally, the video Récolte presents the act of planting that gradually turns into a burial. The conscientious burial moves the poetic imagery towards an agonic outcome. The final watering marks the absurdity of the act. 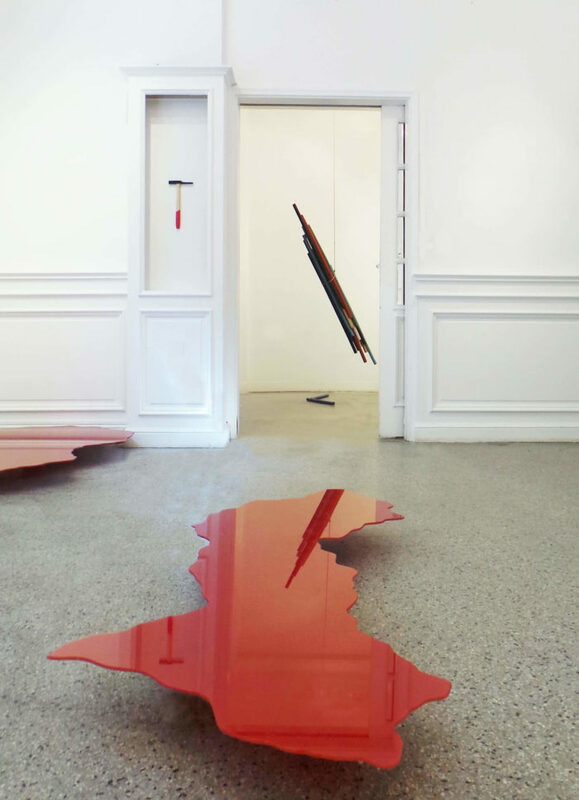 Thusly, with Une éventuelle altération, Zainab Andalibe constructs circumstances where the current state is taken for granted and put into tension with its possible becoming. Here, the alteration is to see from several angles, from the commonly accepted functionality of an object to the physical alteration of a piece and our relationship to knowledge and territories.